The strange name…the thing with ‘Fasano’…nah, I’ll tell you later. (Hang in there.) This is one of the 22 Royal Bourbon sites (complete list, right) that never actually belonged to the Bourbon kings, although it might just as well have. Charles III was extremely interested in the town of Maddaloni, near Naples, since it was right next door (just to the SE) from where his new city (and palace) of Caserta would rise. 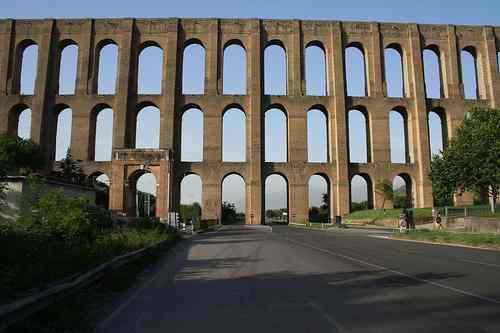 The Maddaloni valley would eventually be spanned by the spectacular Carolino (or Vanvitelli) Aqueduct (image, below), one of the engineering marvels of the 1700s. But that was still in the future when the new young king he arrived in Italy in 1734. Thinking ahead, he coferred the title of “City” on Maddaloni, the center of a large feudal holding in the hands of a significant family in the history of feudalism in southern Italy, the Carafa della Spadera. The Maddaloni fief had been in their hands since the 1400s. Maddaloni, itself, as a place name goes back to about 800 and was the name of the local castle. The town, itself, is on the site of ancient Calatia, an important town to both the Romans and their fierce historical enemies, the Samnites and one that they contested on various occasions. King: "Larry, listen up for a sec." Vanvitelli: "Sire? Sock it to me." King: "I figure this new Caserta Palace is going to need about one zillion gallons of water per second. So --here, help me unfold the chart-- maybe we need a little waterway. Check Home Depot; I think it's open on weekends. All you have to do is start up here, right between the first two S's in Mississippi and bring it through this mountain, pop it across this valley, then through this other mountain and bring it out right here above the fountains of the palace. I make it about 40 km (although the French have not yet invented the metric system. I am farseeing, as you can far-see!) and Bob's your uncle, you're in! How about about it, Larry, can you do that for me?" The Sterza di Penta hunting lodge, itself, remained in private hands until the unification of Italy in 1860 and well into the age of united Italy. It was expropriated in 1939. Today it is restored and houses, appropriately, the Archaeological Museum of Ancient Calatia. Oh, fasano. Don’t waste your time (like some people I know) looking for Fasano di Maddaloni as a place name. It doesn’t exist. Fasano is a dialect form for the modern Italian fagiano—pheasant. Fasano is close to Latin (phasianus), French (faisan) and Spanish (faisà) (Charles III's native language, by the way). In German, it's Fasan, so maybe Goethe went hunting here, too. The crowned heads of Europe had apparently developed some sort of fowl Esperanto, which, now that you bring it up, uses fazano. So, it's not The Fasano di Maddaloni Hunting Reserve, but rather The Royal Pheasant Hunting Reserve. No, I don’t know what the king and duke did if they came across a non-pheasant fowl. I like to think they blew it to smithereens, anyway. King: "Duke, my noble underling -- rise and shine! Get your gear. Get mine, too, while you're at it. We're off to stalk the wild fasano!" King: "That's what I said--fasano. Are you deaf?"